This security poster illustrates the PMA-2 Former Yugoslavian anti-personnel mine. This pressure mine features a characteristic “star shaped” pressure plunger on the top of the mine. The mine is regarded as a “minimum metal” type of mine and is difficult to detect electronically. This is one of the smallest anti-personnel mines. This security poster features the description, technical specifications, and operation of the PMA-2 Former Yugoslavian anti-personnel mine, an illustration of how pressure anti-personnel mines are often mixed with stake mines, two illustrations of the PMA-2 without the safety pin, and a sectioned PMA-2 with the safety pin attached to the remote arming cord. 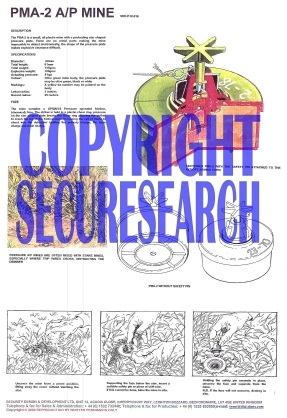 The security poster also contains illustrations and descriptions on how to disarm the PMA-2 anti-personnel mine. A sectioned PMA-2 with the safety pin attached to the remote arming cord. Two illustrations of the PMA-2 without the safety pin. An illustration of how pressure anti-personnel mines are often mixed with stake mines. Illustrations and descriptions on how to disarm the PMA-2 anti-personnel mine. The description, technical specifications, and operation of the PMA-2 Former Yugoslavian Anti-Personnel Mine. This security poster features the description, technical specifications, and operation of the mine, two illustrations of the PMA-2 without the safety pin, and a sectioned PMA-2, illustrations and descriptions on how to disarm the PMA-2.